It has just been over six months’ period when the dream project envisaged by Shri Gulshan Kumar was formally inaugurated by the renowned Bollywood film Producer-Director Nikkhil Advani in the presence of Dr Mahesh Sharma, Minister of State (Independent charge) Ministry of Culture, M.o.S. Ministry of Environment, Forest & Climate Change. Since then, under the guidance of Smt. Sudesh Kumari, it has moved miles ahead on its mission and has made a deep impact on the Industry and the people whose opinion matter in this field. With the successful completion of two batches, GKFTII has scaled greater heights. 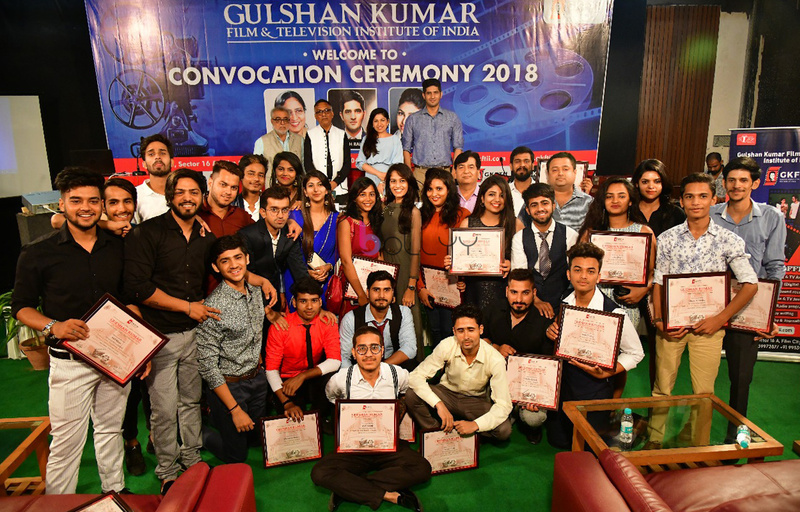 It was emphasized at the convocation by the Dean of GKFTII that the efforts made by the faculty and staff on its students, and has not only helped them academically but also has brought them to the limelight. Good wishes have started pouring in from the Industry celebrities like Sanjay Dutt, Vidya Balan, Akshay Kumar, John Abraham, Nikhil Advani, Faraz Haider and many other Producers and Directors, for the success of GKFTII. On the day of the event, i.e. on 11th August, 2018, the enthusiasm and excitement among the students to set out on the long voyage in career building. While the Convocation Ceremony started with great vigor, the atmosphere in the auditorium was charged with mixed emotions. For months, the young minds had gone through the rigors of the training and there was a mystic sense of vacuum as they currently were free from the daily schedule of attending the classes, which had become more of a habit by then. Some felt the pangs of separation from their classmates and teachers. Some students are eager to showcase themselves and have started pitching. The faculty and staff were praised by the management which gave a boost to their moral. Mr Hitesh Ralhan, Director GKFTII, told the students that opportunities in this field will knock on their doors in disguise and they have to be alert enough to grab the opportunity to showcase their talent. Sanjay Vidyarthi, the renowned Bollywood Music Director & Singer who was responsible for SaReGaMaPa, Indian Idol, The Rising Star, etc. enthralled the jam packed audience of students with his melodious voice. He is the mentor of many big names like, Abhijeet Sawant, Rahul Vaidya of Indian Idol fame, Anik Dhar of TVS SaRe GaMaPa, Hemant Bijwasi from ‘The Rising Star’. Prominent among our students under his able guidance like Nikhil Kumar, a student of Tseries StageWorks Academy, whose song has been released by T-Series, entertained the students with his soulful singing. Another student Tanishka Bahl whose show ‘Love me India’ will air in the month of September, sang some versatile numbers and enthralled the audience. Cherry on top of the Cake came in the form of a beautiful song ‘Paniyon Sa’ sang by our very own Ms Tulsi Kumar- renowned Bollywoood Singer and Director – GKFTII. She also congratulated the passing out students and wished them very best in their Endeavor. Now, that the students are well equipped with greater knowledge and required skill-sets after their training at GKFTII, they could see the horizon closer to themselves and their dream destination looked a real possibility. Students got emotional as they felt that they were closer to their alma- mater and dreams. Prof. Kalyan Sarkar, Dean GKFTII, asked the students not to be deterred by the competition in the field as there is always a room at the top even as the lower and the middle rung of the ladder is clogged with competition. He also reminded the students about their responsibilities towards the GKFTII, the media and the society at large. The event was a grand success and we wish all the students best of luck for their respective fields. FYI TV 18 brings to you ‘The Baker Sisters’!